Sometimes, good magic tricks use deep math or physics. 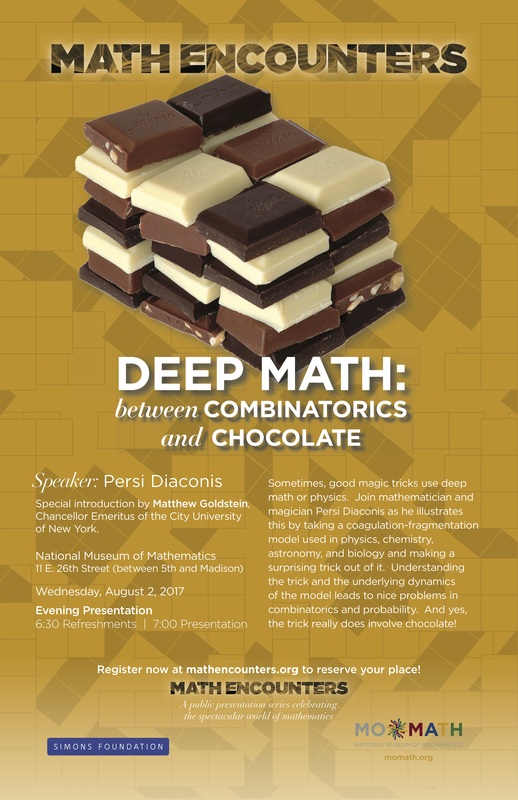 Join mathematician and magician Persi Diaconis as he illustrates this by taking a coagulation-fragmentation model used in physics, chemistry, astronomy, and biology and making a surprising trick out of it. Understanding the trick and the underlying dynamics of the model leads to nice problems in combinatorics and probability. And yes, the trick really does involve chocolate! Although the August 2 Math Encounters presentation will only be running at 7:00 pm, there will be another special event taking place at 4:30 pm. Click here to learn about Platonic Solids: Tiffany lamps, art objects, and stepping-stones to higher dimensions.